As I discussed in my last post, for SGAM this year I wanted to do something more upbeat and hopeful than some of my other Actual Plays, and I've decided to go with a superhero game. Specifically, Palladium's Heroes Unlimited game. One of the great features of Palladium's games for a Solo player is how well them embrace randomness and uncertainty, which is something I plan to exploit for this game. The character is going to be GOOD. He's going to be a Captain America, Spider-man, or Superman (Reeves) style character, not a grim dark avenger like Punisher, Venom, or Superman (Cavil). He's going to have superpowers. Heroes Unlimited includes rules for a variety of heroic types, but I don't want to play a gunslinger "hardware" character or a battle-suited hero or the like. Combat is going to be "comic booky" non-lethal. Even if a character is using swords or guns, people are only "beaten to unconscious" and not killed. Intelligence Quotient (I.Q. ): 5,3,+6 for a total of 14. No bonuses. Mental Endurance (M.E. ): 2,6,+6 for a total of 14. No bonuses. Mental Affinity (M.A. ): 4,1,+6 for a total of 11. No bonuses. Physical Strength (P.S. ): 6,5,+6 for a total of 17. I roll an additional d6 and get a 3, increasing this to 20. A 20 in P.S. gives me a +5 bonus to damage. Physical Prowess (P.P. ): 4,6,+6 for a total of 16. I roll an additional d6 and get a 4, increasing this to 20. A 20 in P.P. gives me a +3 to Parry, Dodge, and Strike. Physical Endurance (P.E. ): 1,6,+6 for a total of 13. No bonuses. Physical Beauty (P.B. ): 3,6,+6 for a total of 15. No bonuses. Speed (Spd. ): 2,6,+6 for a total of 14. No bonuses. Ok, my character is far stronger and more agile than most people. His other attributes are on the high side, but not enough to warrant anything special. The physical attributes can also be improved later, through the selection of physical skills. Step 2 is to determine Hit Points and SDC. In Heroes Unlimited, SDC is a general toughness a character has, and a Superhero can take a lot of punishment and shake it off without ill-effect. 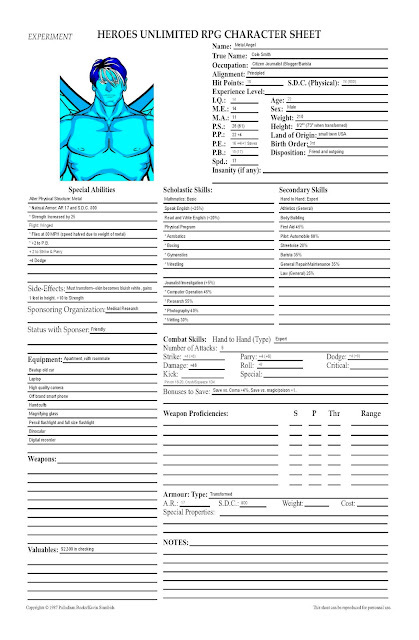 Hit Points represent more dangerous levels of damage, as the character comes close to death. I generally assume most characters will flee or surrender if they start taking Hit Point damage. But, these values will change radically based on later rolls; Hit Points are derived from your P.E. attribute, and this might be increase with skills. Also, may skills and superpower add or change your SDC. As such, I'll skip this step for now. A) Nature of Experiment: 78. Exposure to unknown quantity, the exact cause may never be determined. B) Type of Experiment: 31. Accident; the manifestation of super abilities is completely unexpected. C) Number of Super Abilities: 27. One Major and One Minor. E) Sponsoring Organization: 36. Medical Research Facility. F) Status with Organization: 05. Allowed to leave on good terms. Friendly relationship. Now we determine what his super powers are. With only one Major and one Minor, we will have a limited set of powers, but they can still be pretty impressive. The first Major Ability is: Alter Physical Structure: Metal. This power allows the character to change into a form of pure metal, greatly increasing their strength and resilience. Think Colossus from the X-Men/Deadpool. The Minor Ability is: Flight: Winged. This allows the character to fly, though the weight of his transformation means than he is slower than normal. I decide that his Metal form power is tied to the forced transformation. 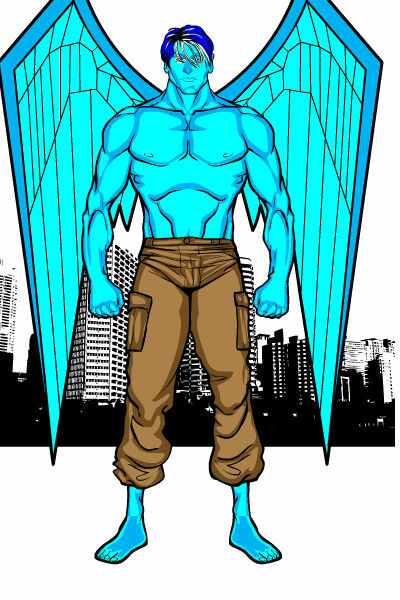 He has to transform into his full metal form to use any of his abilities, including his wings. On the plus side, this makes a secret identity a bit easier--he's a full foot taller, and made of bluish white metal, and has wings. No one would confuse the civilian for the hero! Step 4 is to determine skills. I roll a 13 and get High School Graduate. This provides him with two "Skill Programs" and 10 Secondary Skills. I'll worry about this once I figure out his history. Step 5 is Alignment. This is easy, he's going to be Principled. He values others, always keeps his word, never lies, and never harm an innocent. Step 6 is filling the character our. Basic equipment, cash on hand, that sort of thing. There are also some optional tables I can roll on and get the following information. The Experiment was performed on him when he was in his late teens. For a name, I decide on Cole Smith. A good, comic book style name that is generic, but also plays on his powers. He tries to call himself Seker, after the Egyptian eagle-headed god of metalworking, but to most he's just the METAL ANGEL. Finally, I want to work out his background. For this, I turn to +Zach Best's BOLD system. The defining moment of his childhood was a Fixated Disappearance Overcome by Faction Intervention. I decide that he and his siblings were kidnapped one night. In fact, a large number of other childer were as well, as a mad super-villain Doctor Nightmare had taken them to use their dreams to power a doomsday weapon. Fortunately, the Sentinels of Justice saved them, and Cole began dreaming of being a hero himself one day. In fact, he began obsessively preparing for such a day, and so I decide his two Skill Programs are Physical and Investigator. I assume the defining moment of his teens is related to how he got his powers, and what brought him to the Medical Facility in the first place. I roll and get Brusque Mooks Overcome by Fate. A team of ruthless bank robbers using bizarre high tech weapons hit the town bank, while Cole happened to be there. He was injured protecting his family, which led him to the procedure that changed him. Finally, there's his most recent event. Unlikely Occult (knowledge) Overcome with Favorite Ability. For his first big outing as a hero, Cole was able to use his powers to provide the evidence the police needed to arrest the bank robbers. Of course, the robbers tried to flee and provoked a fire-fight with the cops, but his metal form allowed him to bring them to justice and to save lives! I decide that after the experiment, Cole made his way to the nearby big city of Eagle Harbor, with the dream of being a big hero. He's had a few successes so far, but is struggling in his personal life. With no college degree, marketable skills, or contacts, he's drifted from one entry-level service job to another. His double life makes keep a job difficult, but he's currently working as a barista at a local coffee shop. He lives with a room mate, Scott, who of course has no idea his friend is the new hero. Cole's real passion is to be a reporter, but times are tough. Instead of working at the Eagle Gazette, he's left with a blog and an active forum presence, trying to expose the criminal elements that threaten his new home. And with that, we're ready to begin. 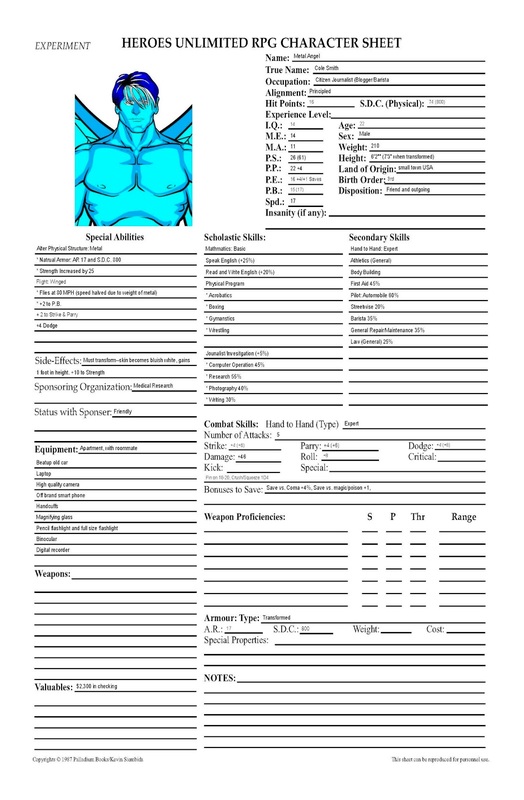 Here's the full character sheet.